Adobe Systems plans to release the final version of Flash Player 10.1 for smartphones on Tuesday, but very few people will be able to use it right away. Flash Player 10.1 is designed to offer a consistent user experience across laptops, desktops, tablets, phones and televisions. The player for desktops became available June 10. Users of phones running Android 2.2 will be the first to get the player, said Anup Muraka, director of technology strategy at Adobe. The trouble is that version 2.2 has so far only been pushed out to review units of one phone model, the Nexus One. All Nexus One phones, Motorola’s Droid and other Android models are expected to get the operating system soon. 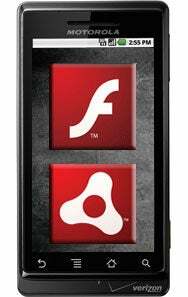 Adobe also is releasing the final version of the player to partners including Research In Motion, Palm, Symbian and Microsoft; however, it’s unclear yet which phones currently on the market might get it. “We have to work with each platform company to figure out which phones can support it,” said Muraka. If existing phones can handle it, Adobe will work with the phone makers to determine how to distribute the player to users. “We may not see a huge number of these devices available on Tuesday, but the pipeline for Christmas, CES, Mobile World Congress next year is really exciting,” he said. The Consumer Electronics Show and Mobile World Congress are two large conferences early in the year where many phone makers announce new products. The software can be pushed out to users over the air or it can be made available in application stores where users can choose to download it, he said. It will also be possible for an operating system provider to display a pop-up for users who visit a Web site that requires Flash Player 10.1, explaining that they need the player and letting them download it immediately, he said. That would work similarly to the way computer operating systems allow people to download the most recent Flash Players when they visit sites that require it. Otherwise, Flash Player 10.1 will be built into new phones that may appear by the end of the year or early next, Muraka said. Flash Player 10.1 for mobile phones will support multitouch, gestures, soft keyboards and other input methods like accelerometers, he said. It will incorporate some other new features aimed at simplifying viewing Web pages on small devices. For instance, double tapping on a Flash object on a page will automatically zoom in on the object, he said. Adobe listed a number of high-profile companies that support the newest version of the Flash Player including Dell, Samsung, Google, RIM, HTC, Arm, Nvidia, Qualcomm, Intel and Texas Instruments. Content partners that said they’re happy for the new release include Turner, Viacom, HBO, MSNBC and Photobucket. One company notably absent is Apple, which has publicly derided Adobe and is pushing the next-generation HTML 5 instead. Many content producers have been willing to recreate or format their content for display on Apple’s iPhone and iPad. But many haven’t, as is evident in a comment made by Forrester Research analyst Jeffrey Hammond in a blog post about Flash Player 10.1. He tested it on his Nexus One and wrote: “I think it’s great to not have to deal with ‘little blue cubes’ on the sites I visit every day.” Instead of content, iPhone users see blue boxes on pages designed with Flash. Still, Apple’s stance throws a wrench in Adobe’s strategy. “[Adobe] realized there was an opportunity in the market and they got ahead of the game and positioned themselves to be the cross-platform form factor across mobile and desktop,” said Al Hilwa, an analyst with IDC. “They thought it was just a matter of implementing those variations but it turned out it’s not just that. The owners of the platforms like [Apple’s CEO Steve] Jobs have to say we’ll use it, and he didn’t,” he said. However, all of the major platforms except the iPhone are supporting Flash Player 10.1. That means that developers who wish to make their content available to most smartphones will be able to use Flash to cover most devices, creating separate content or applications for iPhone users.